Astronomer Edward Barnard wasn’t even looking for planets that night in November 1909, when he trained the Yerkes Observatory’s Bruce photographic telescope on a portion of the sky in the constellation Taurus. Surveying a region around Halley’s Comet, he took a wide field exposure for one hour 19 minutes, stored the plate, and duly recorded it in his logbook. 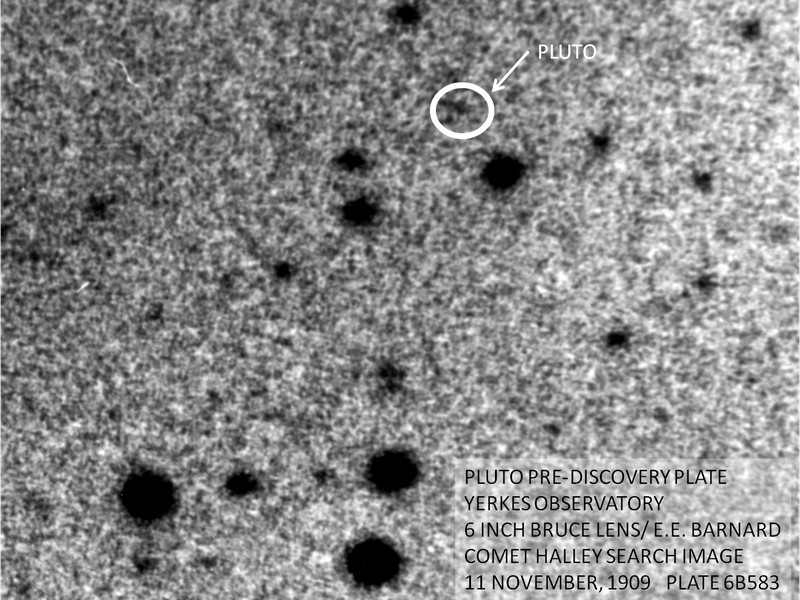 Nearly 100 years later, astronomers at Yerkes looked again at Barnard’s photographic plate from November 11, 1909, and another taken on August 21 of that year, and found what they believe are the earliest known pictures of Pluto, exposed 21 years before the planet was even discovered. The announcement by Clyde Tombaugh in 1930 that a new planet had been found sent astronomers all over the world rushing to their archived photographic plates to see if they, too, had pictures of the distant object. Fourteen such pre-discovery pictures have been verified, the oldest a 1914 exposure at the Konigstuhl Observatory in Heidelberg, Germany. Within months of Tombaugh’s announcement, Barnard’s successor at Yerkes, Frank Ross, reported finding Pluto on plates exposed at the observatory in 1921 and 1927. He didn’t mention the 1909 images, even though he examined them at the time. But the modern team of Greg Buchwald, Michael DiMario, and Walter Wild used a tool unavailable to Ross—MegaStar sky atlas software that gives a precise position for Pluto at any date past or future, based on current orbital data. By overlaying the simulated MegaStar position on the 1909 photos, Buchwald and his colleagues found tiny dots—nearly at the limit of what can be distinguished from the photographic grain of the old plates—at the same position. Are these dots in fact Pluto? 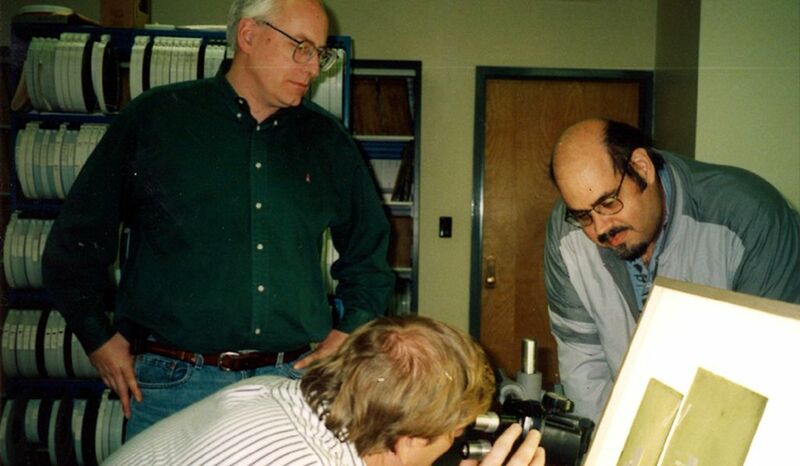 Recently, Wayne Osborn and Frank Mills of Yerkes reexamined the 1909 plates and compared them to modern Palomar sky survey photos of the same part of the sky. The results were slightly ambiguous, complicated by the fact that the Palomar images show faint stars at nearly the same position as the claimed Pluto. But on the November 11 exposure, Osborn and Mills see a “faint elongated image at the indicated position of Pluto and we consider this identification fairly certain.” Verification depends on an independent measurement of the precise positions, which hasn’t yet been done. Until then, our earliest confirmed photo of Pluto remains the one taken in Germany in 1914.